This week we headed to the Crimson Lounge in the Sax Hotel, the House of Blues swanky hotel, for our Word on the Street segment. It was the preview party for the Chicago International Film Festival, which runs October 16 – 29. Each film at the festival will be a premiere, so every night is an opening night, according to festival organizers. This year’s festival is dedicated to Roger Ebert. As for events going on in the city this week, there’s no question that Fashion Focus Chicago is the most anticipated event. It’s the fourth year for this showcase, an opportunity to feature Chicago’s up-and-coming fashion designers. Who would think of Mayor Daley as a proponent of keeping our fashion scene on the cutting edge, but give him props, he conceived of this idea and has made it happen. Check out my interview with the City of Chicago’s Melissa Gamble previewing the event. Geek alert! Wired Nextfest kicked off today in Millenium Park. Don’t know what it’s about? Then you’re probably still rockin’ a Sony Walkman and predicting the Internet is still a fad. For the rest of you, get more info here. It may not feel like Fall, but make no mistake — the calendar will soon say October, and you’ll be making your Halloween plans. Well, while the weather is still a bit less than frightful, check out Fright Fest at Six Flags Great America through November 2. Six Flags will transform from theme park to scream park! OK, that’s their words, but if you’re into this sort of thing, this is the place to be. Click here for more info. -The Weber Ultimate Tailgate, located on the Southeast lawn (outside Gate 6) of Soldier Field, is free and open to the public. The Tailgate will open two hours prior to kickoff for the first four regular season home games: September 21 vs. Tampa Bay ; September 28 vs. Philadelphia ; October 19 vs. Minnesota and November 2 vs. Detroit. Fans will be able to enjoy music, receive autographs from Bears alumni players (this week Otis Wilson and Dan Jiggetts will be appearing), and compete in a variety of football skills competitions. Festivities start at 5pm Sunday. -Dennis McKinnon to Host 2nd Annual Celebrity Golf Tournament And Pre-Event Party “Dance Da Shuffle” at Excalibur Nightclub. 640 N. Dearborn 6-11 PM on Sun Sept 29th. Proceeds from the outing, silent auction, and dinner will benefit the IOFOC, an organization meant to raise money for underprivileged youths. “I’m extremely proud to have my name and several of my former teammates behind such a great cause,” McKinnon said. “Everyone who comes out will make a big difference in the lives of kids.” The soiree will also be a Bears game watch party, as the Monsters of the Midway take on the Philadelphia Eagles at 7:15. -The golf outing, formerly known as the Bad Pants Open, is set for an 11 a.m.
shotgun start on Sept. 30 at Schaumburg Golf Club located at 401 N. Roselle Road. Although the name has changed, the concept has not – players still embarrass themselves, wearing the worst golf outfit they own topping it off with their “old school” jersey. Besides McKinnon, other 1985 Chicago Bears are slated to appear and participate in the event include – Willie Gault, Richard Dent, Dave Duerson, Jim McMahon, Steve McMichael, Emery Moorehead, Matt Suhey, Otis Wilson, and Jim Covert. The cool thing about this city is that there’s an endless number of great venues…and every once and a while they host some pretty worthwhile events. A great example is this Sunday the 28th at Cubby Bear where they’re hosting PAVE’s Fear No Fashion fundraiser–a cause near and dear to my heart. PAVE (Promoting Awareness, Victim Empowerment) is a national multi-chapter non-profit organization who use education and action to shatter the silence of sexual and domestic violence. Their mission is simple: to stop domestic and sexual violence before it even starts. PAVE’s founder, Angela Rose, is herself a survivor of a sexual assault. But don’t fret! With such a sensitive topic the event will be anything but depressing! PAVE, along with their other host, neighborhood salon Lather Chicago, has some awesome entertainment planned like fashion shows from local designers Borris Powell, Christopher Anthony, and Evlove Intimates custom lingerie (hubba hubba). There will also be some cool burlesque acts and appearances by Nadia Underwood from Beauty and the Geek III, Josh Mora from Comcast SportsNet, and model / TV host April Rose. There will also be a silent auction of some great items. But most of all it’s for a great cause!! Doors open at the Cubby Bear, 1059 W. Addison, from 4 pm – 8 pm. Tickets are $ 20 each and can be purchased at the door. You can find out more about PAVE at www.pavingtheway.net. When I say ‘ Fashion’ and ‘Party’ ‘in the same sentence, you know I’m talking about AKIRA. The stars have aligned in perfect sequence and tomorrow, Sunday September 28th, (My golden birthday), AKIRA’s 5th Annual Garden of Eden fashion show is going down at the Galleria Marchetti. Tickets are only $15 if purchased in advance, $20 at the door. Word to the wise, get your tickets in advance, I’ve seen the lines from the previous years and they are impressive to say the least. Paradeisos will feature Ford models showcasing the hottest fall fashions from AKIRA inspired by Greek gods and goddesses. The event starts at 4:30 with the fashion show expected to jump off around 6:30. This is the second consecutive year AKIRA is teaming up with Chicago based Immerman Angels and donating all proceeds from ticket sales and a portion of boutique sales to the not-for-profit organization. Immerman Angels is a 100% free service that teams up caregivers and cancer survivors with cancer fighters to offer one on one support through their battle with the disease. It’s a great organization that has helped countless people who have had cancer or their lives affected by the disease. In addition to the fashion show, there’s so much to get into, the evening is packed full of different activities. There will be a silent auction, an AKIRA boutique, live musical performances and even massages and manicures provided compliments of Zazu Salon. Come on out and celebrate my 28th with me and my friends at AKIRA and Immerman Angels! Tickets can be purchased at AKIRA stores and on the AKIRA and Immerman Angels websites. Paul M. Banks a.k.a. The Sports Bank White Sox fans, if you think watching the battle back and forth for first place in the AL Central requires a stress relieving object, try being one of the Sox players or coaches. After the Sox lost three games (and their first place standing) in Minnesota, they came home and got beat by the Cleveland Indians in a very sloppy game where their pitching collapsed. It was extremely frustrating to watch the bullpen forget where the strike zone is located. “You can get mad, I got mad, breaking stuff up in the clubhouse…I think it’s the worst first five, six innings we’ve been through in a long time. Hitting guys. Walks. Base hit with two outs. Wild pitch. Terrible. And we got 40,000 people looking at this stupid baseball game the way we played today,” Ozzie said in his post game press conference. By the way, if you haven’t seen the Mad TV parody of Ozzie Guillen, click here. If you thought Ozzie was a difficult person to lampoon, then you really need to check it out. So the next time you feel like cursing at the television and throwing objects in frustration, “don’t look back in anger,” as Oasis used to say. Remember these quotations. They will remind you that the White Sox themselves are feeling the same emotions you are. For more Chicago Sports analysis and discussion click here. Paul M. Banks a.k.a. The Sports Bank As the back and forth of the White Sox AL Central race concludes this weekend, I’ve had more mood swings than Naomi Campbell and Lindsay Lohan combined. The “Hunt for Black October” roller coaster ride gives me so much tension and anxiety, that an outside observer might assume I was an AIG shareholder. On Thursday night, I left my house happy and confident with the Sox up 6-1 in the 5th inning. I attended the Stephanie Izard (Chicago Top Chef winner) Diva Series event at Madame Tartine downtown. It was a fun time partying with fellow Street Teamers Desiree Prieto and D.C. Crenshaw as well as hostess Sarah Vargo. But the party became a lot less fun (for myself anyway) when I found the television at the end of the bar and camped out to watch the Sox lose the biggest game of the season in extra innings at the Metrodome in Minneapolis. For some reason, following the game online with my brand new Smartphone made blown leads seem more calming. My text messaging back and forth with the Soxman fails to alleviate my anxiety. Getting into very mean sounding, but ultimately hilarious text message wars with the lead Twins writer of my site, Peter Christian is an enjoyable pastime, but it still doesn’t soothe my nerves. 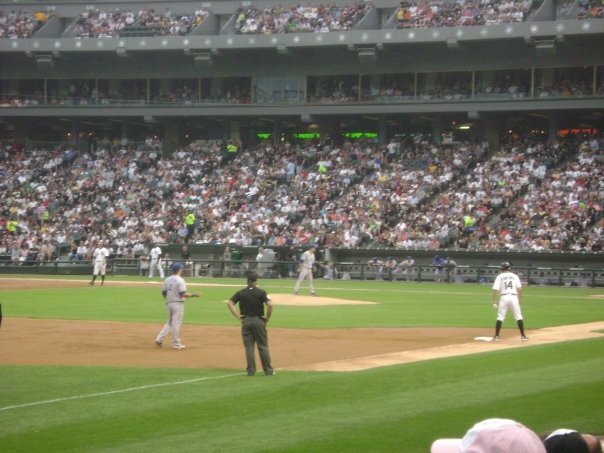 On Friday night, I watched the Sox lose a home contest to the Cleveland Indians (and fail to recapture first place from the Twins who got blown out at home by the Kansas City Royals that same night) from the Press Box at U.S. Cellular Field. Coincidentally, there was a Tampa Bay Rays media guide laying near my seat in the press box. Given that Tampa is the team the Sox would most likely play in the postseason, I think this is more than serendipity. I think it’s a sign. Or at least I hope. In my next segment, I’ll tell you what manager Ozzie Guillen and the players themselves have to say about handling their pennant race stress.